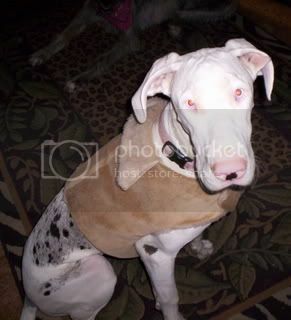 OK, so I posted a picture of a coat I made for Gracie last week. 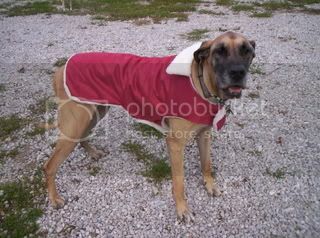 I have had several people ask me to make them coats for their Big dogs (mostly Danes. I made a new pattern that is a bigger coat, it extends all the way back to the tail. It closes in the front with heavy velcro, and around the chest also. It is made with durable fabric (faux suede upholstry fabric) and fleece type inside material. I am trying to decided what a reasonable price is for them. I know Big Paw clothes tend to be expensive...I want to charge a reasonable price, but not rip myself off in labor.What do you think? Re: How much would you pay???? I used thick upholstry fabric for the "suede" and I double stitch everything. I plan on adding a pocket on the back, and maybe bottons on the chest area (it velcros, but the buttons would just look cute). I can also put patches on them...like I plan on making Grace one in pink, and putting a "punk" hot pink and black skull paych I got at the store. LOL I think i will start them at $50 plus shipping, and maybe do a price break for multiple orders...I am also going to do t-shirts and stuff. It is hard to find stuff for XL dogs with everyone catering to the Chihuahuas and stuff. Definitely adorable. Definitely going to be a hit. They look nice and durable too! That looks great! 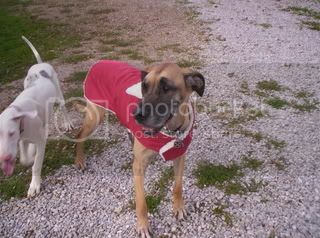 It takes talent to be able to make clothing for any animal (human/dog, whatever) of that quality. As for cost, I think what I would do is add up all of the operating costs, like fabric etc, then for you time, whatever it is that you would expect to be paid hourly at any job like that. Then if it's not already too high, maybe add 10% for the pup as modeling royalties! So I started a site to put my "creations" on. So far I have the sculpts, and the coats. For now the coats are $50 + shipping. I plan to have beds, t-shirts, more art, collars leashes...and whatever else I come up with. After seeing how hard it is to find some of the supplies for big dogs at a reasonable price, I am going to give this a try and see where it goes. What a great site. I love the sculptures and clothing. My guy shave too much fur for clothing, but I would love to order a sculpture of a pyr.